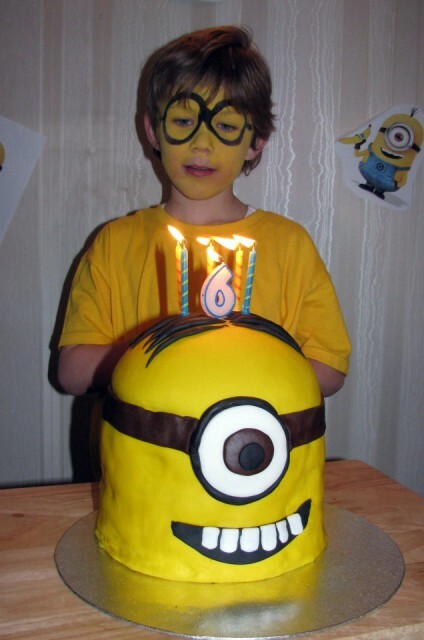 My older boy just turned 6 and for his special day he wanted a Minion Party based on the Minions from the movie Despicable Me. 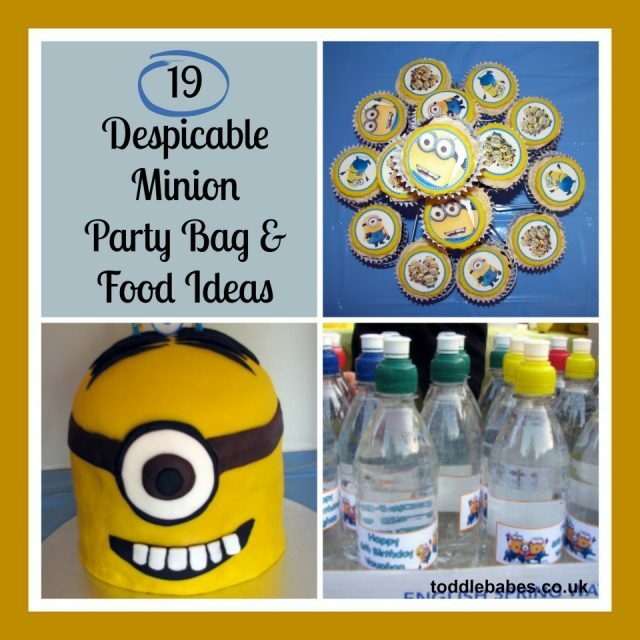 Here are some ideas to use when planning party bags and food for your One in Minion party. Tank Yu! The sisters in the film dance ballet, so you could give out blue or yellow ballet tutus as favors. The villains have a rivalry over their guns so you could give water guns as favours or use them to play a squirting game on a hot day. Sew each child a grey and black-striped scarf, like the one Gru wears. If you can find a grey and white-striped jersey knit fabric, you won’t even have to sew. Just cut the fabric into the lengths you need, since jersey knits don’t fray. If you have a friend or family member who enjoys knitting, and you don’t have too many guests, you could ask her to knit scarves. I super useful and thoughtful party gift that parents would appreciate too. Minions are crazy about bananas so make little bags of banana shaped foam sweets. In keeping with the yellow colour theme, provide each child with a yellow t-shirt along with minions iron-on transfers (they could do this at home or you could do it before putting it in the party bag. Minion stickers. Most kids love stickers, so find a few strips of minion themed stickers and put them in your party bags. Small minion themed toys. With minions being so popular, it is pretty easy to find minion themed toys. Look out for cheap minion toys and put one in each party bag. Minion colouring sheets (you will need to print these out for each guest). I always print out colouring sheets for use during the party, for those guests who want a little calm activity. Just print out a few extras and slip the unused ones into the party bags just before you hand them out. Any of the items they have made during the party (t-shirt/balloon minions/masks). I like to have a craft or art activitty at k=my children’s parties. If you plan ahead, and make sure the party bag is big enough…you could make the item and put it into the party bag as the take home treat. Nothing else needed! By a bag of mini bananas (kid-size bananas in the UK) and put one in each party bag. Gru’s main goal in the film is to steal the moon. Your birthday cake could be shaped like the moon, either using a sphere-shaped cake pan or a flat round one. Cake pops: Frost them yellow, then place Weetos (for goggles) and a few sprouts of black licorice laces (for hair) on each one. Note: some minions have one eye and others have two. Mix it up a bit. If you’re looking for something healthier to serve, cut several bananas in half, leaving the peels on, and pack them together upright and tightly on a tray or bowl to resemble a crowd of minions.You can use a black sharpie to draw eyes and mouths or hair onto the banana skin. Real bables (apples) and bananas. Can’t go wrong with a bit of fruit! Banana and apple shaped or flavoured sweets. Make a jug of yellow (lemon) or blue squash, or find small bottles of yellow or blue drinks and use minion labels, like the ones in the photos, for drinks. You can see I chose flavoured water instead as they were the perfect size for my labels. I guess I could have dropped some colouring into the water to make them a bit more fun. 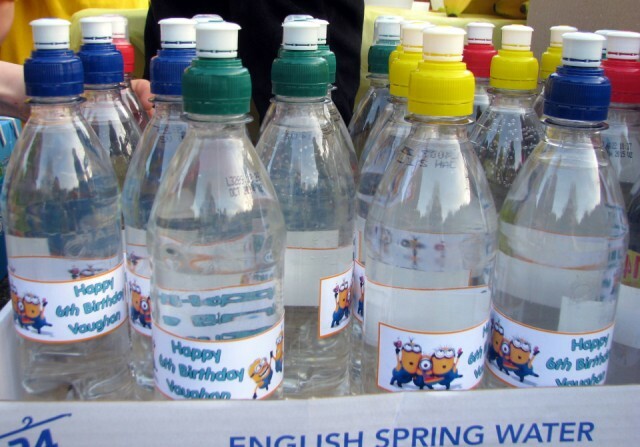 The labels also provide you with a space to write the child’s name on the bottle-no more lost drinks! I also refill the bottles during the party and they take it home if it still has drink in it. Less waste or mess for me to deal with. 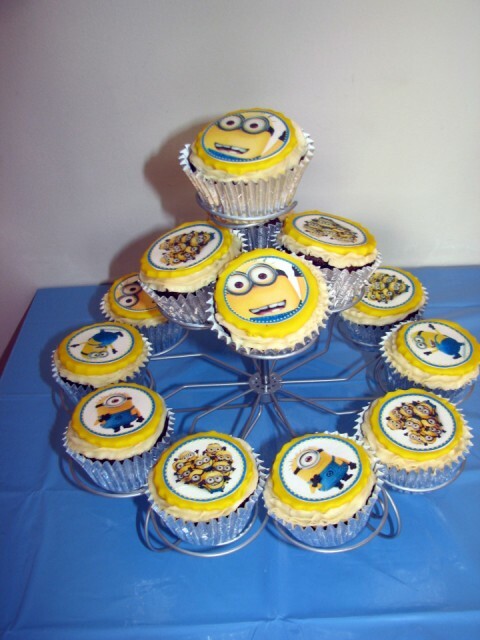 Minion topped cupcakes. 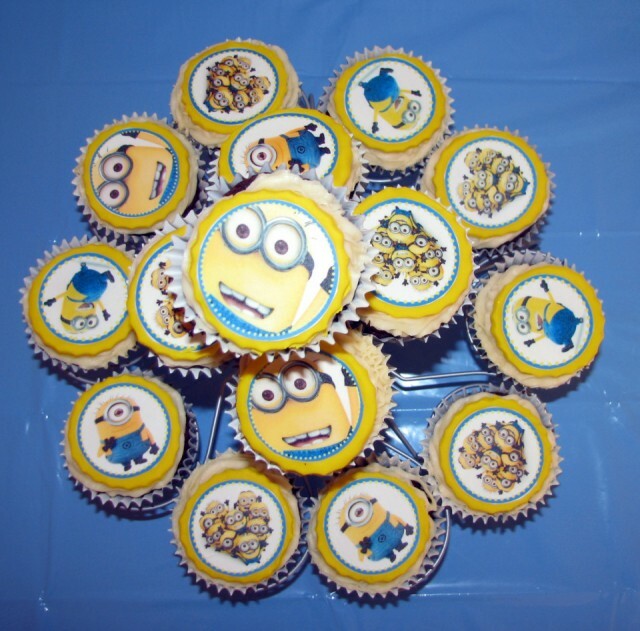 You can easily find pictures of minions to print and attach to toothpicks to make toppers or have minions printed on rice paper, or edible icing sheets like I have in the images above. Yellow and blue coloured food on the party table. 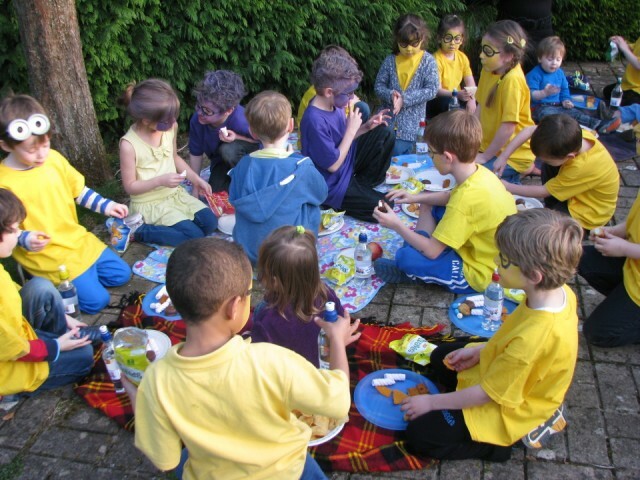 Include yellow and blue jelly, use blue or yellow food colouring to change the colour of normal foods for a bit of fun. 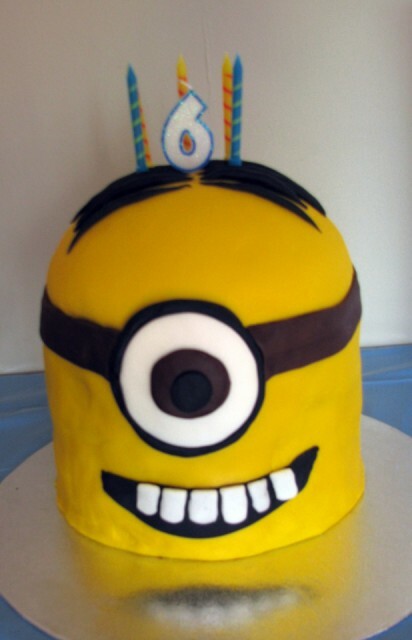 Minion Birthday cake. 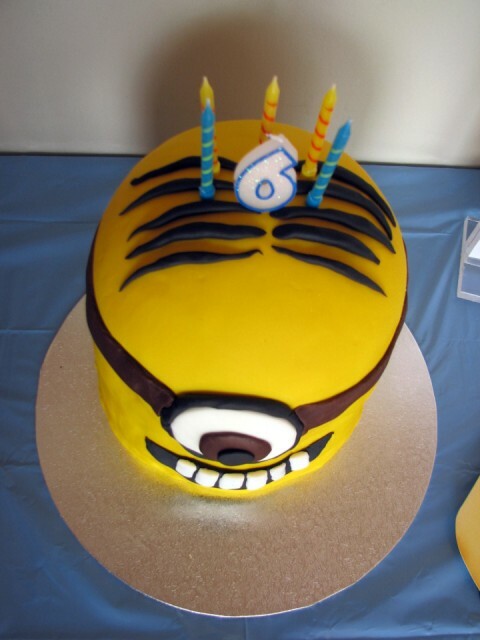 You can make a minion head, like the one I made in the pictures above, or look here for more despicable cake shape ideas. Minions love bananas, so make banana cupcakes or banana bread. Serve banana pudding and banana milkshakes.